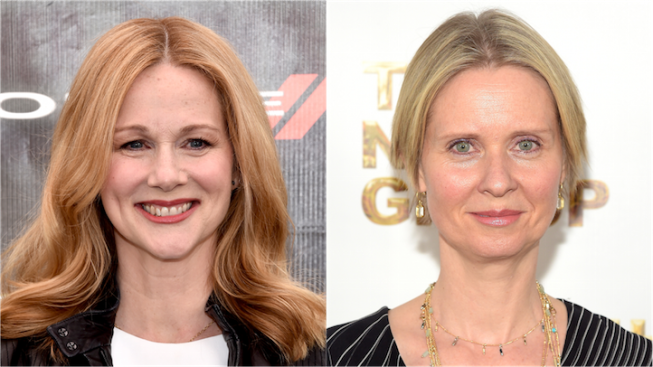 Lillian Hellman's 1939 groundbreaking play "The Little Foxes" will return to Broadway next spring in a revival for the Manhattan Theatre Club led by three-time Oscar nominee Laura Linney and two-time Emmy winner Cynthia Nixon. David Sullivan ("Sylvia") will direct the play, about Regina Hubbard Giddens and sister-in-law Birdie Hubbard -- two members of a powerful aristocratic Southern family in the 1900s who come to heads while trying to strike the deal of their lives. Linney and Nixon will alternate the lead roles throughout the run, in repertory, appearing opposite each other at each performance. A schedule of roles, as well as additional casting, will be announced soon. Previews of the limited engagement production begin begin March 29, with an opening set for April 19 at MTC's Samuel J. Friedman Theatre. Sullivan has previously directed Linney and Nixon at MTC. He worked with Linney in 2010's "Times Stands Still" and 2004's "Sight Unseen." Nixon worked with Sullivan in 2006's "Rabbit Hole," for which she earned a Tony Award. It'll be the first revival of "The Little Foxes" in 20 years. Stockard Channing and Frances Conroy previously lead a production for Lincoln Center in 1997. The play was made into a 1941 film starring Bette Davis. Tickets for MTC's 2016-2017 season are now available for subscribers. Single tickets will be sold at a later date. For more information, visit www.manhattantheatreclub.com.